A history of the male playback singer in Hindi Cinema has as it's backbone the 'Big Three' - Mukesh, Kishore Kumar & Mohammed Rafi. There were great singers both before and after their reign at the top of the charts but few would argue that these 3 artists were the gold standard and were the biggest singers of their day bar none. The marquee actors of the day would be paired up with a respective singer and audiences went to a movie to see not just the stars - but to see how their favorite songs were picturised on the big screen. Shammi Kapoor burst onto the Bollywood scene shortly after his elder brother Raj & around the same time as his younger brother Shashi. His foray into Bollywood in the early 60's coincided with the time that rock & roll was hitting the West and Indian music directors wasted no time integrating this new musical style into classic Indian song compositions. The result was almost tailor made for the Elvis-like Shammi who shimmied & shaked in the song sequences while still displaying some pretty good acting chops. One of his biggest hits was 'Kashmir Ki Kali' and although it has been too long since I have seen the movie to give a meaningful review, Carla & I have once again collaborated on a joint review so please go check out her always insightful musings at Filmigeek. It was a fun movie because of the aforementioned great songs, chemistry between the two stars (Kapoor & Sharmila Tagore) and breathtaking scenery. The lovely vale of Kashmir was a favorite of Bollywood directors but has now sadly become too much of a war zone to do so anymore. Regardless, it's beauty still remains both in real life and on celluloid and this movie showcases the beauty like few others. The first song is Isharon Isharon Mein, a duet sung by Rafi & Asha Bhonsle following the obligatory rainstorm with the lovers taking shelter in the home of an old peasant woman. She provides them with cute local outfits - a scene that led to god-knows-how-many honeymooners in hill stations dressing up as “Kashmiri” couples for keepsake photos :) The music for this song is exquisitely layered and the singers hit every note just perfectly - it remains one of my wife's favorites to this day after she heard it (multiple times) on her most recent plane ride to India - see the video here. The second song is Taarif Karoon, a solo performed by Rafi praising Sharmila's beauty and picturised on the breathtaking Dal Lake - see the video here. "The audience is fickle. You grab them by the throat and never let go." 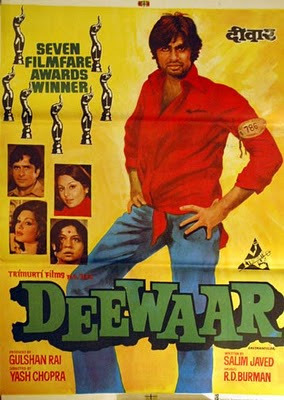 'Deewaar' is one of those few movies (Bollywood or otherwise) that I consider to be a perfect film. By perfect I mean that there is not an ounce of fat in the entire movie - each scene is constructed like a mini film, each line of dialogue is written & placed exactly how it should be, each actor is absolutely tailor made for their role and the story itself is so compelling and different, that it served as a watershed moment in Bollywood history. The story & dialogue were written by Salim Khan (a failed actor) and Javed Akhtar (an assistant director) who got together in the early 70's to write movies together and in the process became legends of Indian cinema. 'Written by Salim-Javed' became a mark that moviegoers searched out because it guaranteed them a movie with taut storytelling, terrific dialogue, memorable characters and more than anything - their ability to connect with every class of moviegoer from high society debutantes to the paan-waalas & taxi drivers. I saw this movie when I was seven in an English dubbed version made for the West Indies market called 'I'll Die For Mama'. It was one of the first Indian movies I had seen and it impacted me for years to come. It made me a lifelong fan of Amitabh Bachchan, who may have made his mark in the Salim-Javed penned 'Zanjeer', but whose true ascent to superstardom lies with this film. 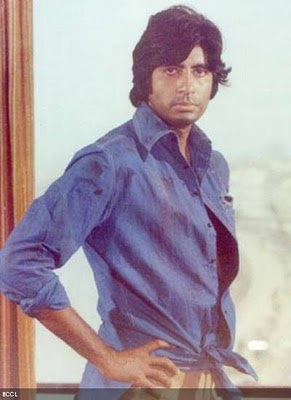 Amitabh's performance as the son of a union leader whose fate in life is decided at a very young age and whose rise from a lowly coolie to the most feared gangster in Bombay's seedy underworld was truly dazzling. Add to that Shashi Kapoor's own transformation as Amitabh's younger brother who owes everything to his bhai's sacrifices but whose own duties as a policeman force him to make decisions that challenge everything he believes in. Each and every scene carries this film forward and is unforgettable in it's own right, it's script is a mainstay at the FTII in Pune as an example of a 'perfect screenplay'. Amitabh still recites the exact lines from the film - especially this scene when he first visits a temple to ask god to save his mother - in his concerts and wipes a (faux?) tear from his eyes after. 'Deewaar' also marked the first time a movie showed a couple (Amitabh & Parveen Babi) smoking a cigarette in bed after spending the night together. Parveen is introduced after the interval and appears in just a handful of scenes but leaves a devastating impact. And the scenes between Amitabh & Shashi when they turn from brothers to sworn enemies are still shown on endless loops on Zee TV today. This movie does not cop out at any point and never gives the audience an easy way out to deal with the fate of it's characters. The ending does not tie up the loose ends nicely nor does everyone live happily ever after. The result is gritty filmmaking that is reminiscent of early Martin Scorsese and is rarely seen in the colorful celluloid world of modern Bollywood. The song for today is the catchy tune Kehdon Tumhe by Kishore Kumar & Asha Bhonsle. It is in complete contrast to the mood of 'Deewaar' and almost seems like an afterthought for the simple reason that it was just that, an afterthought. Legend has it that Salim-Javed turned in the screenplay to director Yash Chopra ('Kabhie Kabhie', 'Silsila', 'Lamhe', 'DDLJ', 'Mohabattein', 'Veer-Zaara' & the just released 'Chak De India') and had the audacity to make no provision for a single song. Not wanting to deviate from the industry standard to include a musical number, Yashsaab supposedly said "picture bahut sookhi hogi" (without them the movie will be very dry) to which the script writing duo quipped "picture ka naam 'Gili Deewaar' rakh dijiye" (call the movie 'Wet Wall' then). See what the first writers whose names were the first ever to grace a Bollywood movie poster gave us & watch 'Deewaar' - the perfect film. "Jean Luc Godard said that if a film has four to five good scenes, the audience is usually quite satisfied. George Lucas said, a good film should have 60 terrific two-minute scenes. 'Deewaar' has a total of 95 scenes and it’s quite impossible to list favourites because they are all so damn good. As writers, whilst working on our own scripts, we often feel inadequate and hopelessly untalented. If we want to feel even worse, please note that Salim-Javed wrote 'Deewaar' in just 18 days. If Salim-Javed took one idea and made two movies, they were to also do a total opposite. They took classics of Hindi Cinema – 'Gunga Jamuna' and 'Mother India' and wonder of wonders, through their amalgamation created a third classic, 'Deewaar'." Click here for more dialogue from the movie. 'Maine Pyar Kiya' (1989) was one of the first Bollywood movies that I saw in the era that I refer to as post-KK, meaning after Kishore Kumar passed away on October 13, 1987 (yes, I took it that hard). I plan to blog about that dark time soon but for today's music selections we look back at this soundtrack that puts a smile on my face to this day. This movie was a blockbuster hit and catapulted Salman Khan into stardom and even though Bhagyashree never had another hit movie, she is still fondly remembered for her role in the film. It garnered four Filmfare awards including Best Movie, Best Music Director, Best Lyrics (Dil Deewana) and Best Singer (Dil Deewana). Salman Khan also got a nomination for best actor for only his second starring role but was beaten out by Jackie Shroff for his role in 'Parinda' - an amazing movie in it's own right. It's obvious now that the filmmakers just caught the mood of a generation where you didn't have to do everything your parents told you and that love could indeed conquer all. I remember watching the movie with my brother (Anand) and just bursting out into laughter at the line "I love you so much it hurts". It still is a corny line but looking back I realize that they really did feel that and it is that feeling that made the movie so memorable. For a more in depth analysis of the movie please visit our friend Carla's site, Filmigeek, as we are doing another joint review today. The first song selection for today is Dil Deewana that is sung by both leads in the movie at different times. And even though the male version sung by S.P. Balasubramaniam won the Filmfare Award, I much prefer the version that was voiced by Lata. See the song with all it's sweetness and goofiness intact (LOVE Salman's matching yellow sweater with Bhagyashree's yellow sari!) here. The second song is the other major hit from the movie, Kabootar Ja Ja Ja in which our heroine dispatches a pigeon (kabootar) bearing a note with the words that all of secretly long to hear one day if we haven't yet already ~ "I love you so much it hurts". P.S. For those of you wondering when these two will be on the screen again, wonder no more and check out this link.